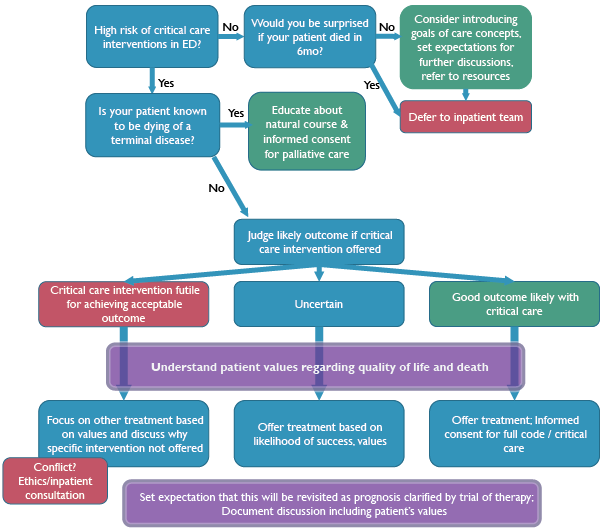 In this two-part series, Dr. Michael Wong begins by reviewing a rational and patient-centered approach to difficult discussions in the Emergency Department around goals of care and resuscitation. In part two, we discuss the process for obtaining consent for incapable persons in the Emergency Department. Heyland et al.1 interviewed 1439 patients and family members across 16 Canadian hospitals and compared the patient/substitute decision maker (SDM)’s self-described resuscitation preferences to the documented code status in the chart. They found a 37% error rate – 35% of patients didn’t want CPR but had a full code order, and 2% wanted CPR and had a no-CPR order. This is an unacceptable level of avoidable medical error. DNR forms were first described in 19762, in an era when whether or not patients received CPR would be up to the resident/staff on call, and decisions were often not shared with patients.3 These forms were an attempt to standardize these decisions to improve patient transparency, autonomy, and to help bedside personnel who would often be first on the scene. Unfortunately, the result was often a menu-like list of options without counseling towards appropriate options – an area in which we must do better. Instead, we should focus on understanding a patient’s values and wishes in life and death, and then use our expertise to counsel patients around risks/benefits/alternatives. Ultimately, we must only suggest treatments in keeping with their wishes. To begin, we must establish patient capacity or identify the best substitute decision-maker. If the patient is not capable, Ontario and most Canadian provinces have a hierarchy of SDMs.8 Some jurisdictions have an age requirement to act as an SDM – in Ontario the minimum age is 16. Once we have the appropriate individual, we can begin. This is a general algorithm that can be applied in the context of CPR vs. no-CPR, intubation vs. no-intubation, or other critical care interventions. Let’s walk through the steps in more detail. Step 1: Is a goals of care discussion time sensitive? In those patients who are not at high risk, consider using the surprise question to screen for patients who may still benefit from a discussion or referral to resources. Step 2: Is your patient known to be dying of a terminal disease? Do they already have palliative goals of care? If so, we should focus our conversation on good dying, educating about the natural course of the disease, and emphasizing interventions we can do for symptom control. Disposition (hospice, home, or hospital) is key, and we should learn what local resources to call and help our patient in their journey. 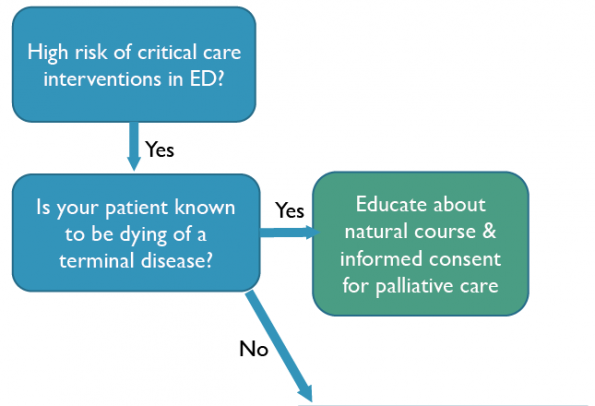 Step 3: Prognosticate – would your patient benefit from critical care? Intubation? CPR? Consider the nature of the acute illness, the patient’s baseline function and comorbidities, and their overall trajectory of life and function. Specifically, for cardiac arrest, the following information may help understand the risks/benefit of CPR. According to 2018 US data,10 amongst hospitals subscribed to a specific data collection and quality improvement system, survival to hospital discharge from cardiac arrest is ~25%, but 15-40% of these survivors will have a poor neurologic outcome. The risks of CPR include a poor neurologic outcome, chronic ventilation/dialysis, and prolonged hospital stay with a high mortality rate. Patients who suffer VF/VT arrests have much better survival rates (49%) than PEA/asystolic arrests (10%),10 and thus, patients admitted for active cardiac disease are more likely to benefit from full code status. The GO-FAR score is the best clinical decision rule for prognostication for in-hospital cardiac arrest. Each of the variables confers additional poor prognosis in a cumulative fashion. Of note, active cardiac disease is not one of the factors – again emphasizing that patients admitted for cardiac disease are more likely to survive in-hospital cardiac arrest. The GO-FAR score may help to trigger or frame your discussion, but communicating numbers and statistics are unlikely to be helpful in an emotional situation. Would you be able to tell me about how things are going at home – what is <the patient’s> day like on a good day? If <the patient> could have this conversation with us, what would <the patient> say about this situation? Would it be ok for me to share my recommendation as to how to best care for <the patient>? Combine your medical expertise and thoughts around the risks/benefits of CPR, intubation, or other critical care interventions you are proposing to form a recommended course of treatment. Treatment can be a simultaneous combination of disease-modifying and palliative-like symptomatic care.14 For instance, low doses of morphine for dyspnea can be effective in pulmonary hypertension, COPD, and CHF exacerbations. Document your discussion, and what the patient/SDM said about their wishes and values in quality of life. Set the expectation that this is dynamic and may change as the inpatient teams understand more about the patient’s illness — handover well to the inpatient team. Let’s normalize goals of care conversations and prioritize learning the medical expertise and communication skills required to effectively engage and advocate for our patients. Heyland DK, Ilan R, Jiang X, You JJ, Dodek P. The prevalence of medical error related to end-of-life communication in Canadian hospitals: Results of a multicentre observational study. BMJ Qual Saf. 2016;25(9):671-679. doi:10.1136/bmjqs-2015-004567. Rabkin MT, Gillerman G, Rice NR. Orders Not to Resuscitate. N Engl J Med. 1976;295(7):364-366. doi:10.1056/NEJM197608122950705. Rabkin M. Orders Not to Resuscitate: The Origin of the DNR Order. Open Pediatrics. https://www.openpediatrics.org/assets/video/orders-not-resuscitate-origin-dnr-order. Published 2017. Diem SJ, Lantos JD, Tulsky JA. Cardiopulmonary Resuscitation on Television — Miracles and Misinformation. N Engl J Med. 1996;334(24):1578-1582. doi:10.1056/NEJM199606133342406. Shif Y, Doshi P, Almoosa KF. What CPR means to surrogate decision makers of ICU patients. Resuscitation. 2015;90:73-78. doi:10.1016/j.resuscitation.2015.02.014. Portanova J, Irvine K, Yi JY, Enguidanos S. It isn’t like this on TV: Revisiting CPR survival rates depicted on popular TV shows. Resuscitation. 2015;96:148-150. doi:10.1016/j.resuscitation.2015.08.002. Gehlbach TG, Shinkunas LA, Forman-Hoffman VL, Thomas KW, Schmidt GA, Kaldjian LC. Code status orders and goals of care in the medical ICU. Chest. 2011;139(4):802-809. doi:10.1378/chest.10-1798. College of Physicians and Surgeons of Ontario. Consent to Treatment. ; 2015. doi:10.1080/09585189108408619. Lunney JR, Lynn J, Hogan C. Profiles of older medicare decedents. J Am Geriatr Soc. 2002;50(6):1108-1112. Benjamin EJ, Virani SS, Callaway CW, et al. Heart Disease and Stroke Statistics – 2018 Update: A Report from the American Heart Association. Vol 137.; 2018. doi:10.1161/CIR.0000000000000558. Ebell MH, Jang W, Shen Y, Geocadin RG. Development and validation of the Good Outcome Following Attempted Resuscitation (GO-FAR) score to predict neurologically intact survival after in-hospital cardiopulmonary resuscitation. JAMA Intern Med. 2013;173(20):1872-1878. doi:10.1001/jamainternmed.2013.10037. Gray N. How do you discuss code status? Cartoons of common traps. The Ink Vessel. https://inkvessel.com/2017/12/14/how-do-you-discuss-code-status-cartoons-of-common-traps/. Published 2017. Accessed March 28, 2019. Weingart S. Podcast 165 – The Semantics of End of Life Discussions with Ashley Shreves. 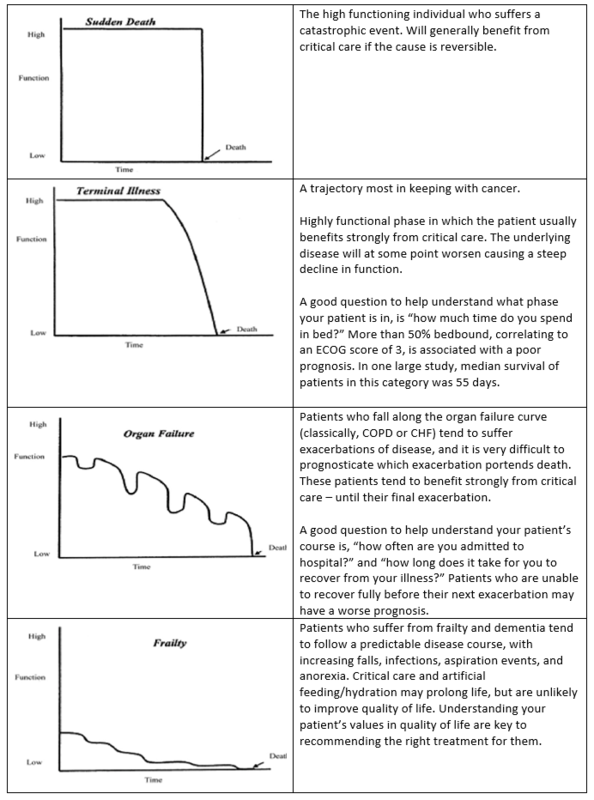 2016. https://emcrit.org/emcrit/semantics-end-of-life-discussions/. Murray SA, Kendall M, Boyd K, Sheikh A. 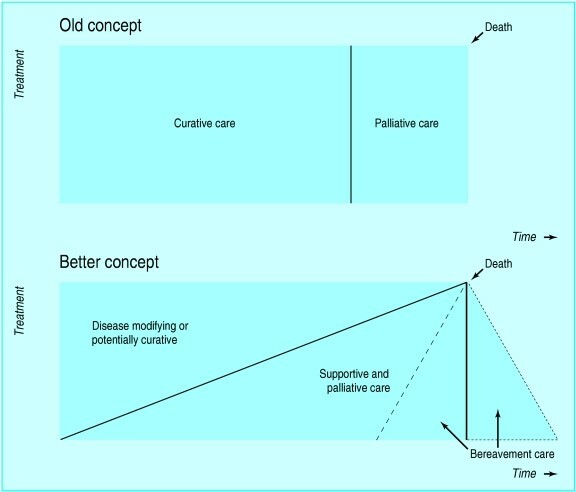 Illness trajectories and palliative care. BMJ. 2005;330(7498):1007-1011. doi:10.1136/bmj.330.7498.1007. You JJ, Downar J, Fowler RA, et al. Barriers to goals of care discussions with seriously ill hospitalized patients and their families: A multicenter survey of clinicians. JAMA Intern Med. 2015;175(4):549-556. doi:10.1001/jamainternmed.2014.7732. Dr. Michael Wong is a 3rd year Emergency Medicine Resident at the University of Ottawa with a special interest in end-of-life communication, health literacy, and simulation. In the upcoming year, Michael will be a point-of-care ultrasound fellow. 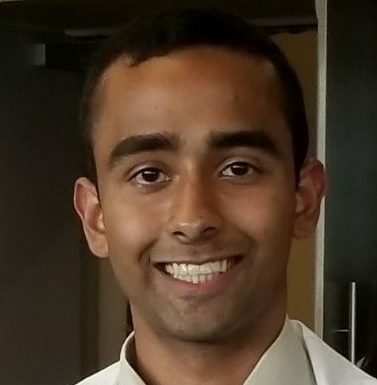 Shankar Sethuraman is a 2nd year medical student at the University of Ottawa. His interests include the use of technology in healthcare and quality improvement in Emergency Departments. Outside of medicine, he enjoys tennis, repairing bikes, and reading a good book.